Published on March 30, 2011 in General. 0 Comments Tags: Spray Fabric, Spray on cloth, Spray on clothing, Spray on fabric. What I like about this series is that there is always something fresh, new and exciting to share with you – like today’s video – spray on clothing… Yep! Believe it. Published on March 4, 2011 in Creativity, General, Motivation and Positive Thinking. 0 Comments Tags: Cancer Research, Cancer Survivors, Cancer Treatments, Ground Breaking Research, How To Beat Cancer, Malcolm Simons. A friend of mine just made the cover of the Chinese Journal Of Cancer Dr Malcom Simons. I’ve blogged about his inspirational perspective several times on this and other blogs. The cover portrait entitled, “Dr DNA”, is of Professor Malcolm James Simons. Born in 1939 in New Zealand, Simons was Director of the WHO Immunology Research & Training Centre, University of Singapore, from 1970 to 1976, during which time he established an HLA genetic laboratory for Chinese, Malays, and Indians and discovered HLA genetic associations with diseases including nasopharyngeal carcinoma and hepatitis B-associated hepatocyte carcinoma. Perhaps best known as the inventor of the 1989/90 “junk DNA” patents that found diagnostic value for genome-wide association studies in non-coding DNA, Simons created another suite of far-reaching patents on single chromosome analysis of linear DNA and of epigenetic haplotypes starting in 2005. In 1979, Simons and his life-long colleague, Brian Tait, were the first foreigners to conduct an HLA and NPC Workshop in China at the Sun Yat-sen University Cancer Center. In 2010, now a visiting professor in the same university, Simons is bringing a lifetime of experience to HLA and whole-genome data analysis of NPC that he expects will reveal hitherto-unrecognised genetic characteristics. Simons is eight years out from a diagnosis of the currently incurable cancer multiple myeloma. During this time, he has continued working throughout his various treatments. As befits an indomitable spirit with a formidable focus, Simons has been even more productive, using the cancer as a means of reevaluating his life, researching, and developing another biotechnology company. 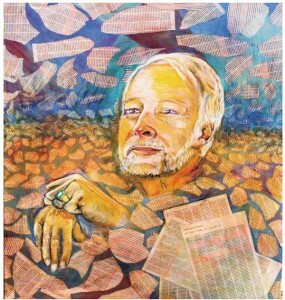 The cover portrait, created by Ann Abrahmsen, an artist and Simons’ wife, shows him serene yet slightly quizzical, surrounded by a sea of DNA printouts, his hands at rest, and his contribution to the work complete. To read his latest editorial and related manuscripts in this issue of the Chinese Journal of Cancer, please see pages 79-123.